(This report is from an eyewitness giving an accurate account. He speaks the truth so that you also may continue to believe.) These things happened in fulfillment of the Scriptures that say, "Not one of his bones will be broken," and "They will look on the one they pierced." Our faith is built on the eyewitness accounts of those who saw Jesus daily and told his story at great personal cost. Our faith is built on the trustworthiness of God, who is faithful to fulfill his promises. We don't believe based on a blind hope or a broken psyche desperately in need of some magical fix. While the human condition is sick beyond human repair, our faith in a heavenly solution is rooted in God, who became flesh and walked in our world and died our death to give us his life. 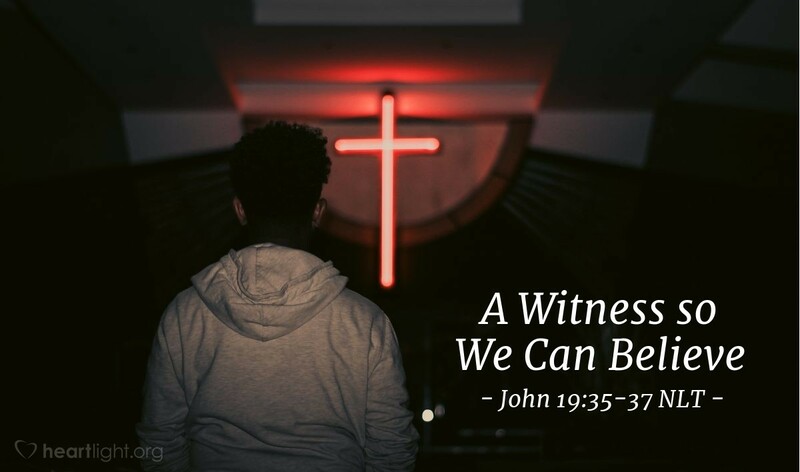 The changes in ordinary men and women who watched that life, death, and resurrection are part of the chorus of testimony on which we build our faith. Believing in Jesus as the Son of God may be a leap of faith, but it is not a blind leap! It is a leap based on the testimony of witnesses who had seen Jesus on this earth and found their lives changed and enriched in the process. Father, I know that even my faith is a gift of your grace. I thank you that this faith is not something I have had to develop on my own. I thank you for a heritage of faith of people who have shared the story of Jesus with me. I thank you that this heritage goes all the way back to men and women who ate and talked with Jesus and witnessed his life and death. Even more, I thank you that this story doesn't end in their witness to his death, but includes his resurrection. I thank you for the faith of others that has helped me to develop my faith. I pray that I may share my faith and pass it on to others. In Jesus' name. Amen.